Lately, my day ends before my husband’s so I’m usually finishing dinner as he walks in the door (except the nights he’s supposed to cook, but we won’t get into that…). Often times he’s wowed by the intricate dishes I assemble, thinking I’ve spent hours hunching over the stove. Sometimes I feel like I should throw some more dishes into the sink for him to wash, or throw flour all over my face like the mom in the early 90s Rice Krispies Treats commercial did to exaggerate the effort I put forth. You know the one. But really it’s not that hard to whip up something fantastic in a short amount of time. The key is to stick to fresh, seasonal ingredients, ditch the crazy array of spices and stay simple. 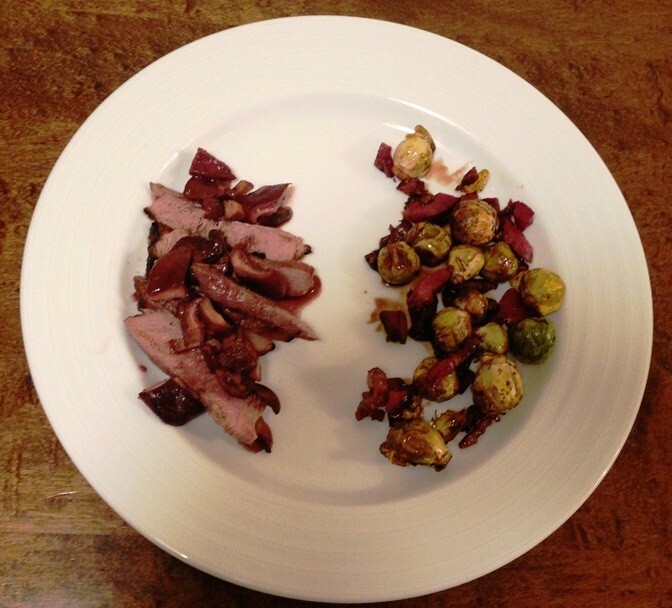 The other night I made Sirloin Steak with a Mushrooms Port Reduction and a side of Brussels Sprouts with Bacon. I don’t have a recipe for this one, but it was pretty easy to throw together. A simple broiled steak, reduced sauce and side. The side was based on other another dish I’ve made, Sweet & Savory Brussels Sprouts. Instead I chopped up some thick cut bacon and cooked it until almost in a skillet. I drained the excess oil, add the sprouts, sautéed until tender and bright green, then poured a bit of balsamic over the dish and tossed. For the sauce I added a small splash of olive oil and a generous handful of mushrooms to a nonstick skillet to cook. Once the mushrooms were tender, I added a cup of port, reduced the heat and let that all reduce to a thick sauce (5 minutes). I broiled the streak (seasoned with salt and pepper) for about 5 minutes on each side, sliced it up, poured on the mushroom sauce and served along the sprouts. A gourmet meal in less than 30 minutes, including cutting and chopping! Beat that.